Based in a time where the worst criminals and scum run free, the Police have no choice but to hire more Bounty Hunters for help. Are you ready to hunt these villains down? Are you ready to make lots of money? Then you're ready for the Bounty Head Bebop RPG. 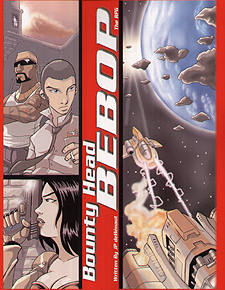 Set in a gritty near future and based on high-octane anime, Bounty Head Bebop is a wild ride through the new Solar Frontier. Full of fast-paced action and sizzling drama, Bounty Head Bebop lets you play solar system-spanning anime-style adventures and live the "never say die, say profit" life of the bounty hunters of the 'far modern' future. The Bounty Head Bebop RPG is powered by the Inverted 20 system, which uses a single d20 for all rolls and offers a quick and easy resolution, but it's not rules light. It's rules quick. This book is all you need to get started in the world of Bounty Head Bebop, including an overview of the universe, rules for physics, space ships to fly across the solar system, and all the guns you need to put a hole into your next bounty. Also included is a full adventure "Small Fry" which launches your Bounty Hunting career with a bang! Welcome to Bounty Head Bebop!